Before proceedings to our main topic, you need to know what is actually a Slicer. A Slicer is an interactive control. A Slicer makes your job easy to filter data in a Pivot table. 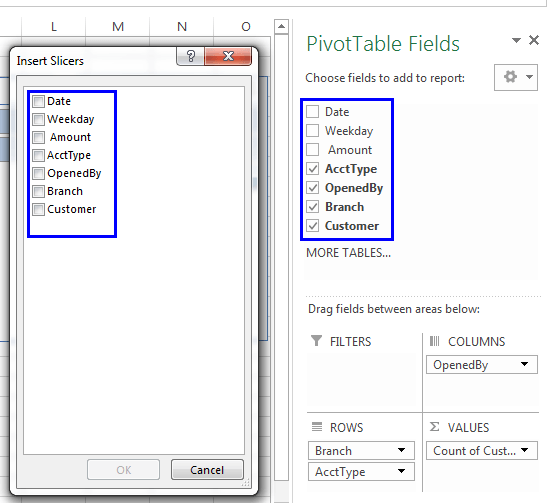 The following figure shows a pivot table with three Slicers, their headings are AcctType, OpenedBy, and Branch. Each Slicer is containing a particular field. In our example, the pivot table is displaying data for Savings account, Opened by New Accts at the Central branch. A Slicer lists the items from the field. Just click a button to filter data in the pivot table. You can choose more than one button pressing CTRL while choosing buttons. Press Shift and click to select a series of consecutive buttons in the Slicer. The following figure shows a pivot table and a pivot chart. We have used two Slicers to Filter the data (by State and by Month). In our example, we have selected the data for Arizona, Florida, and Kansas, for the Months of March through May. Slicers provide a quick and easy way to create an interactive chart. Two Slicers are controlling the data in the pivot table.